When you’re chowing down on a delicious pizza pie, you’re not necessarily thinking about how it’s made, especially something as specific as the yeast in the dough. But without this simple, yet complex ingredient, pizza wouldn’t be pizza but some strange soup, and who wants that? 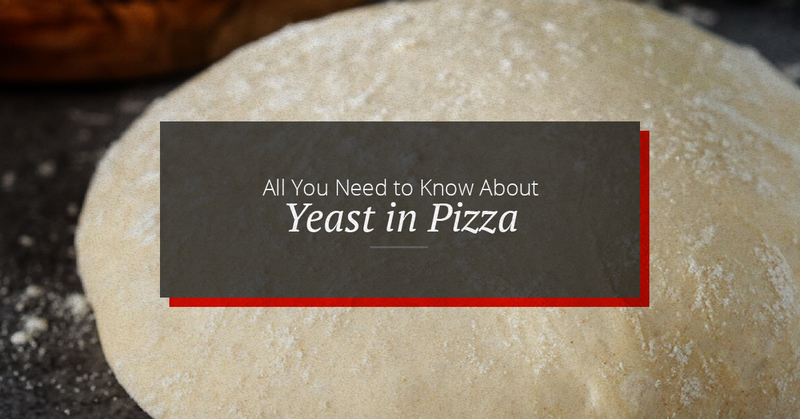 The crust of your pizza starts with yeast, a microscopic fungus. Starting with that to the cheesy goodness on your plate, learn all you need to know about this essential pizza ingredient. A living organism, yeast is single-celled fungi and there are hundreds of different species of yeast. Some records show that there were yeast breads in ancient Egypt, though they may not have known how it worked. Granulated yeast became available in 1872. Yeast loves sugar and sugar-rich materials that come from fruits and plants. Yeast can be found throughout nature, even in the air that surrounds us. The one we need to know about is baker’s yeast. Many are aware that yeast is used in making bread and beer, but do you know how it works? How yeast works is actually very scientific. Yeast feeds on sugars that are in the dough’s ingredients and turns the sugar into carbon dioxide. When carbon dioxide is created, little air pockets are formed in the dough. During the baking process, the yeast is killed, but the air pockets remain the dough, thus creating an airy and fluffy crust. 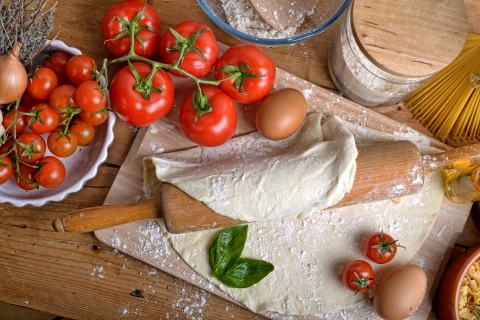 Start Designing Your Own Pizza! First, you need to know that all flour has yeast in it. 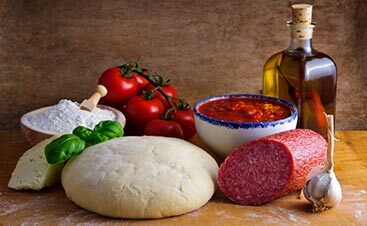 Even though active-dry and instant yeast are available, wild yeast can add a flavor and texture to bread and pizza dough are complex and has a sturdier texture. To capture both the yeast in the flour and the yeast available in the air, a sourdough starter is mixing flour and water and letting the yeast do its thing! After about five days of letting the mixture sit and adding some extra flour and water to keep the science moving, the yeast becomes usable and is ready to be turned into bread. This type of yeast has its name because the package of yeast has both live yeast cells and dehydrated cells. During the manufacturing process, live yeast cells are dried quickly at a high temperature. This leaves about 30 percent of the cells alive and the remaining cells are dehydrated. Before using this variety of yeast, it needs to be “proofed,” or dissolved in warm water, hydrating the yeast cells. After dissolving the yeast in water the mix can be put into the dough. This yeast has more living cells in it, making it easier to use. The yeast doesn’t need to be proofed like the active-dry yeast so it can be put directly into the other ingredients. There are some who still proof the yeast to ensure that it’s a good batch, but this isn’t necessary. Now that you have the skinny on what yeast is, how it works, and the different types, let’s dive into what you can do with it! When you mix yeast with flour, water, and salt, you get pizza dough. But there are different types of dough that can be created depending on the ratios of ingredients and how long the dough sits before it’s baked in the oven. Using just a few ingredients, extremely hot temperatures, a high-protein flour, and a long fermentation process (letting the yeast do its thing in the dough), with this type of dough you can get a crispy crust with a soft and chewy center. This dough doesn’t need to be kneaded, either. Mix up the ingredients and let them sit in the refrigerator for a few days and you’ll have a dough that Italians would be jealous of. This dough uses cooler temperatures (but still hot) and the same base ingredients, but sugar and olive oil are added. The dough is still allowed to sit for a day but is mixed with a food processor in order to develop the gluten. However, the oil is used to tone down the gluten, creating a more tender dough. The sugar is used to help brown the crust, giving it a crunchy texture. 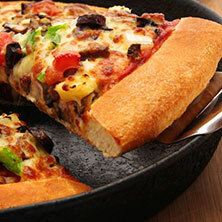 Commonly square, this pizza will have a soft texture and crispy crust. The dough includes all of the basic ingredients plus some extra water. 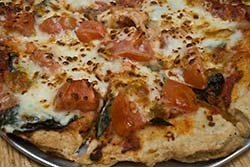 Typically made on a baking sheet, the sheet is oiled and the dough is spread out and topped. The dough still needs about eight hours of rising time but will result in a doughy, chewy crust, with a crisp on the bottom. Are you hungry yet? The next time you sit around a crusty, cheesy pizza, you can impress your friends and family with some pizza knowledge. 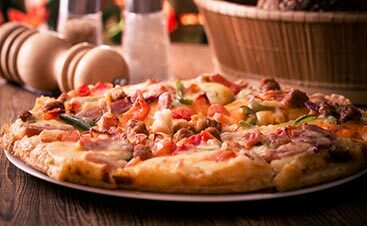 At Upper Crust Pizza, we have spent years perfecting our dough and have found a perfect base for fresh ingredients and stretchy cheese. From classic Margarita to unique New Mex, try our award-winning pizza in the heart of Santa Fe. Allergic to gluten? We have gluten-free pizza that just as fresh and delicious. 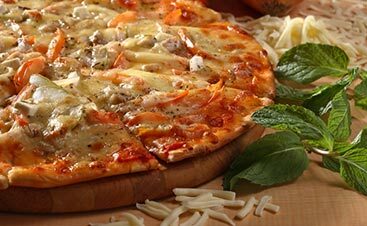 Come in today to try our gourmet pizza.